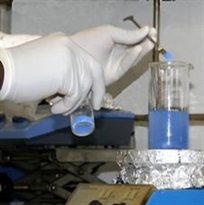 With its advised engineers by experienced researchers, RBnano offers an R & D service dedicated to innovative materials. This service helps you to develop industrial personalized solutions from the feasibility study to the production. RBnano takes advantage of specific tools, many devices and platforms available in materials institute of physics and chemistry of materials of Strasbourg. With the same devices and with innovative methods (Inkjet, Oxide solution deposition, Spray, Hot Spray…), we produce processes which are inaccessible by conventional vacuum deposition methods: PVD, PECVD, Ablation, Laser. • Techniques for solid characterization (DRX, UV-Vis, Raman, FTIR, Granulometry, Zetametry, optical magnetic measurements, microscopy, AFM). • Magnetic materials, Hybrid sol-gel materials, metallic conductive materials, TCO (=Transparent conductive oxide),, optical materials.